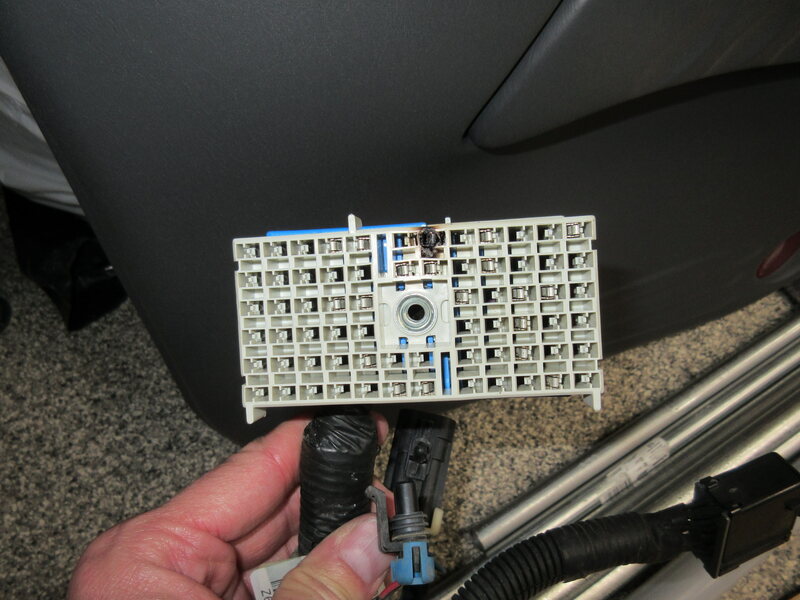 This large connector plugs into the bottom of the under hood fuse block. There are two others this size (dark gray and black). One is attached to the main body harness and the other is attached to the engine harness. 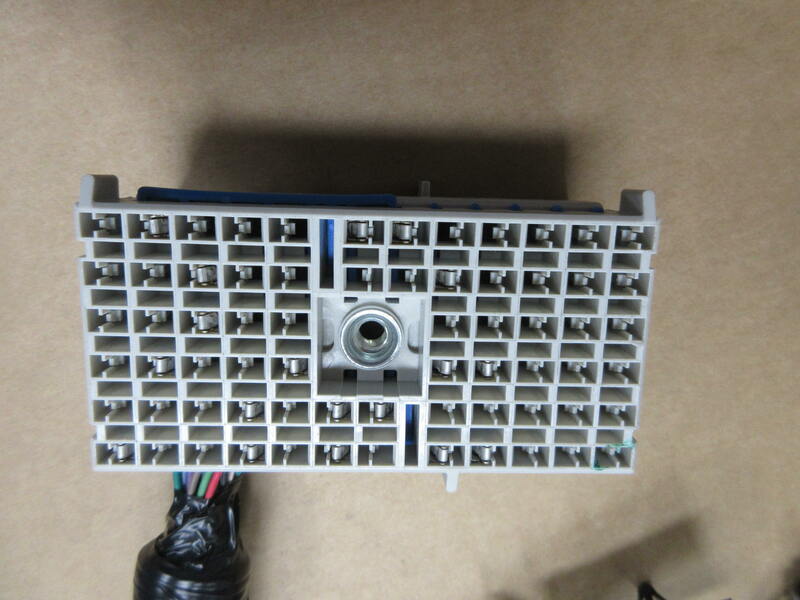 There is also one small (green) 2-cavity connector. Can anyone spot the problems here? There's the blatantly obvious burnt terminal. Those with a keen eye will also note that GM built the new wiring harness incorrectly. The large 68 cavity connector is 180-degrees out. It will not plug into the bottom of the fuse block. Electrically it's correct if I turned it 180-degrees, however the harness MUST come out the corner shown. I thought about changing the orientation myself, but the wiring going into each of the cavities will be too long or short. If I adjusted, the overall harness would be too short. I need to contact GM and find out if they're aware of this. They built this particular harness on April 8, 2017, so fairly recently. Just looked now and saw it. Sounds like a high amperage draw of some sort. And what GM will tell you is that you will need the new electrical center to match. I sure hope that isn't their response. With other revised parts, they've always told me what other items must be installed if ordering the updated item. I'll find out Monday I guess. I was thinking that they probably don't order a whole bunch of these at a time and this may have been part of an incorrectly hand-assembled batch. To be quite honest, I don't know how wiring harnesses are currently manufactured (hand versus automated). I'm planing to replace the electrical center anyway. The terminal burned pretty good. I used a very fine grit (600) sandpaper to clean it but unfortunately ended up taking off some of the plating in the process. Even at that, there was still pitting so I'd be worried about proper future contact regardless. That circuit is for the right engine cooling fan. Not sure why the problem unless it was simply a dirty contact for some reason. I never had any problems with the fans that I'm aware of. I tested them tonight once I repaired my original harness and reinstalled it. I commanded them on and off with my Tech2. Both spun up quickly and when I shut them off, both slowed to a stop over several seconds stopping within one second of each other. This suggests that either both or neither are a problem in causing increased current draw. They seem quite free when I spin them by hand. The connectors on both fans looked fine. The dealership ordered another updated version of the wiring harness for me today. We're hoping the first one was just a one-off manufacturing error. The replacement wiring harness arrived the other day. When I picked it up, the 68-cavity connector was oriented correctly. The part showed a manufacturing date code of about one year earlier than the first one they shipped. Unfortunately, my Bonneville is already in winter storage so it will be spring before I can install it. I'm working on getting a new fuse block anyway so I've got some time. The dealership ordered one for me but there is no stock anywhere. It wasn't officially listed as discontinued so I'm holding out 'some' hope. I haven't been told that GM canceled the order but I'm going to check in again tomorrow.